A beauty bloggers trip to London isn't complete without a, 'I don't need anything but I want to browse Selfridges beauty department'. I had seen all over our faithful friend social media so much hype on these lip creams. NYX as a brand is so affordable and of a good quality. It would of been rude to not have bought some, right? The lip creams are so great for something to the have in your bag and reach for in times when you need that pop of colour. They're soft, creamy and dry completely matte. When I say matte I don't mean unbearably uncomfortable to wear, can tell you've got something on matte. Strangely, I found the darker shade to be slightly more comfortable to wear than the light one. I found that the lighter one, after time went quite patchy and a tad bitty around the edges. Chucking on a second coat over the top as soon as you realise this works wonders and goes straight back to looking lovely and fresh. The face power is really fine and really nice once put on the skin. I haven't really noticed anything particular about the longevity of keeping me looking matte as I've been testing out a few different bases recently however I'll update you. The brow mascara, however isn't something I'd bother to re-purchase. Compared to my super crazy cheap Miss Sporty clear mascara, it's actually quite pants and find my brows looking out of place not long after applying it, which, is a bit disappointing but as it didn't brake the bank its all good. What have you tried from NYX? Any recommendations? Being comfortable is a necessity for me when it comes to fashion, and especially on Sundays. I really like the whole smart trouser and trainer combo (mixing smart with casual) and think it's just a great contrasting get up. I am normally styling up outfits like this for those little trips into town for coffee and a mooch around, and an over the shoulder bag is a perfect starting point. Love a good tan accessory and this is the perfect size to carry around your essentials, IE , phone and purse. 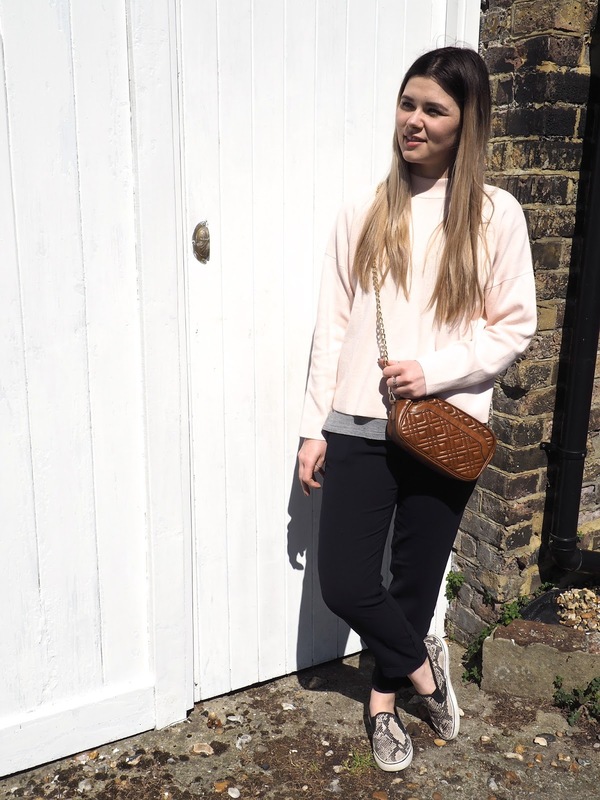 Although it was sunny, it was pretty nippy so a lightweight jumper was the ideal layer to chuck over my v-neck top. I'm a bit of a sucker for trends and find myself searching the relevant hash tags as soon as a new trend hits the fashion and blogging world. The whole blush pink is still everywhere and long for it to suit me, but it really doesn't (which I'm genuinely gutted about). 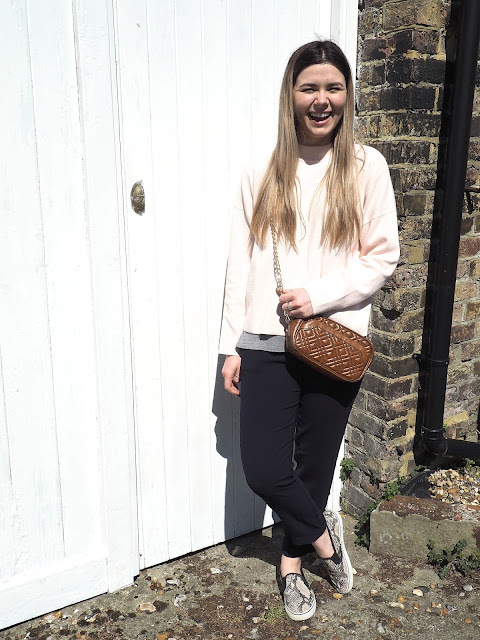 When I spotted this pale pink jumper in H&M I tried it on straight away and was so happy with it as it's the closest thing to the blush pink trend I'll get. Do you enjoy and comfortable Sunday outfit? What are your go to pieces? The fear really does set in on the approach to the end of the half term, evaluating whether or not you've used the time wisely. With this thought lurking in the back of my mind a trip to the seaside to enjoy the last of my spare time was on the cards, heading to the two B's, Brighton and Broadstairs. Spending the whole day Friday in Brighton was nice, however the weather wasn't on our side. A good few coffee stops to hide away from the non stop rain was broken up with seeing friends and family, which is always a heart warmer and incredibly fulfilling. I had three delicious coffees in and am actually considering doing a Brighton coffee stop post as there's some great places you MUST try as a coffee lover. If you're ever in Canterbury and am into the healthy way of eating, then you must take a visit to Kitch. A weekend isn't the same without my little trip for a yummy vegan brunch and some bliss balls to take home. They're very much the same as some from Deliciously Ellas book and taste so good and accompany a green tea perfectly. Can we also just appreciate how good these plastic flowers are that I picked up from a local charity shop. I was so chuffed I found them as pretend flowers (that look real) are so hard to find. Sunday started off slowly due to the copious amounts of cocktails I consumed the night before, cocktails being THE best way to celebrate a friend's birthday if you ask me. My parents instigated the trip to Broadstairs, and I'm so happy we tagged along to endure the beautiful skies, an ice tea and a stroll along the sea front. It really was the perfect last day of my half term. To top this weekend off I've discovered some new make up from NYX which will be up on the blog end of this week. 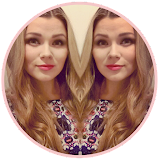 Lip products, face powder and brow mascara, all of which are affordable, long lasting and pretty good quality. To summerise, I've had a wonderful weekend that has really given me a buzz of happiness. I strongly believe that a weekend or just a Sunday spent in the right way can set you up for a great week. Back to school, the weathers wonderful and it's nearly summer. I hope you've all had a weekend that's made you happy and remember, we can handle whatever this week throws our way! I'm pretty sure I spent the majority of the Easter weekend in the kitchen baking which I'm pretty happy about. Even though I'm dairy free and gluten free I really enjoy making things for others to eat. This means some of these baked treats aren't freefrom (which I'll label clearly). This major baking session didn't come out of the blue, it was spurred on by Zoe who put up an Easter treats video a few days ago. Minding my own business the other evening I watched it as I brushed my teeth and decided then and there that Easter weekend was going to be spent baking. 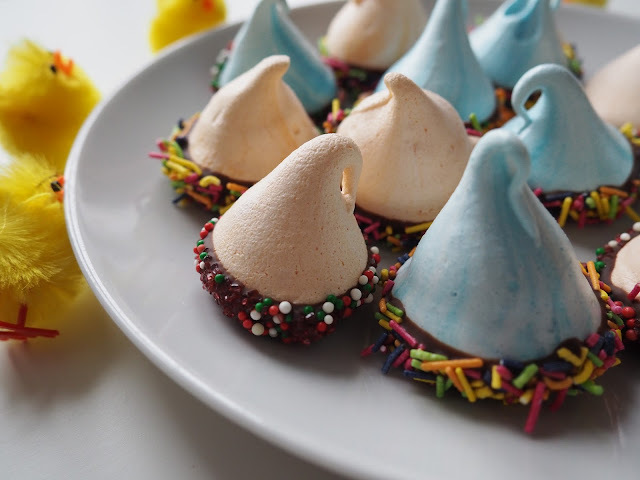 The first treat I made were these Mini Confetti Meringues. I made these gluten and dairy free by using Vitalife dairy free butter and dark chocolate that contains no dairy or wheat. As they're small they're great for bite sized treats, but do still take an hour to bake in the oven. You can use whatever sprinkles you want, but if you are dairy free or gluten free make sure to read the labels! Secondly came the Cream Egg brownies which aren't freefrom what so ever, but boy don't they look good! I make these every year for my boyfriend as he loves them and use a brownie recipe I've had for years. If you want a recipe to follow specifically for these then this from ASDA is very similar. As a kid I remember loving Rice Crispy squares so much and everyone at school used to take the Kelloggs ones. Well, who needs Kelloggs when you can make your own with added chocolate eggs of your choice?! I decided to use gluten free Rice Crispies from Nestle and then mini eggs (which I can't eat but can eat around), That way I can still enjoy them. Did you do any baking over the Easter weekend? Do you have any recipes or treats you think I'd like to make?